I can recall the emotions of running my last marathon like they were yesterday. It was September 2009 and I was running the Toronto Waterfront marathon. I was running along on Queen Street on my way to the finish at the 35K mark. I kept thinking to myself, 42 kilometres is an incredible distance and I was never going to get to the end of it. I was hurting in pain as I ran through each remaining kilometre to the end. As I crossed the finish, I felt a sense of finality. I was proud and satisfied with the accomplishment and also content with my inner self that this was my final marathon. When I first started running, I thoroughly enjoyed the sport and loved accomplishing what were once unthinkable goals. To think that I could complete a marathon let alone a number of them over the years was foolish. Each training season, I channeled my training towards the goal and was ultimately successful. Yet, over the years, each race started to become more about the time than accomplishing the goal – to finish and have fun. I can recall so many expos where fellow runners would ask me about my time before they asked me what my name was. As I stood at that finish line last September, I felt uneasy with the premise that running for me was a chore. Without the pure enjoyment of the sport, why continue? As I tried to work through this dilemma, I continued to run here and there. Enough to keep fit but not enough to call myself in form. A few weeks later, a few friends invited me to go running with them. I decided to give it a try as I had trained entirely by myself over the past 5 years. All those long hours on the road were just me, myself and I. As I started on that run and more over the next few weeks, I got this profound sense of happiness. I enjoyed going for a run and chatting about all things of life. I began to look forward to the long run on Sunday and getting together with everyone for a run. As each run came and went, the conversation also moved around but there was one topic that kept coming up – Ultra running. A few members of the running group were ultra runners. As I listened intently to their stories from their races, I became mesmerized with the thought of going beyond the marathon distance. In just a few weeks, I went from tittering on quitting running to all of a sudden wanting to run an ultra. Was I crazy? My wife thought so. So the goal was created. I was going to run the 50 miler/80 kilometre ultra at Sulphur Springs in May 2010. And so the training picked up. Each weekend, we gradually increased the time and distance. I recall one weekend in February when we ran 42 kilometres. That was a marathon and the very next day, I was walking like it was nothing. After each marathon, I was hobbling for days and cringing at the notion of having to go up and down the stairs at home. In no time, we were going beyond the marathon distance for a training run. We pushed the enveloped each time and adapting to the distance was crucial. In April, I ran my first Ultra. It was a 53 kilometre race in the Seaton Trail in Pickering. I treated it like a training run as it was only a few weeks from the big goal. I crossed the finish 6hrs and 18mins later with a big grin on my face. I danced my way over the finish line and right there I knew that Ultra running was for me. I loved being out in the trails enjoying the incredible surroundings. I found the minutes and hours melted away as I ran through the forests. On May 29th at 6am, I started what would be the longest run in my life, 50 miles. The thought of running for the majority of the day continuously was daunting. As each kilometre came and went, I began to realize more and more that completing the race was within reach. I channeled my inner thoughts to focus on the course and not the kilometres. It was going to be a long day and focusing on that was fruitless. As I got to the final aid station at 78 kilometres, I was overcome with joy. I ran those final 2 kilometres like it was a victory lap. I pushed myself to finish strong and finish well. As I crossed the finish line, I couldn’t hold the excitement and I screamed in complete joy. I did it! I found my inner happiness again that I thought just 7 months prior was lost for good. Did it hurt? Absolutely! It took about 3 days before I could walk normally and about a week before I was back out on the long runs. I called my wife shortly after the race to tell her about my accomplishment. As I talked with her, I pontificated that the 50 miler was far enough for me and going any further was insanity. Little did I know that I would be eating those words just a couple of weeks later. After the race, I began to think about what’s next. Every runner faces the challenge of deciding on the next race. Should I do another 50 miler? Should I take a break? Or perhaps, I should go further. In the days after the 50 miler, I sought counsel from a couple of 100 milers to get their view on what it took to finish the ultimate distance. As I listened intently, I began to realize that the 100 miler was for me. 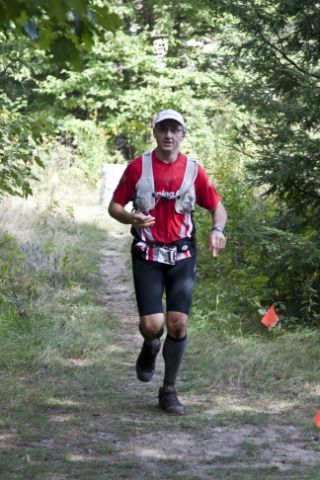 I focused on an ultra race on September 11th, the Haliburton Forest Trail Race. About two weeks after the 50 miler, the gang got together to revel in our collective successes at Sulphur Springs. We talked about what was next for everyone. As we went around the table, I finally put it out there. I finally said it. I wanted to do the 100 miler. Surprisingly, no one was surprised; in fact they were extremely supportive. One friend gave me a huge piece of advice. Before signing up for the race, go out and run the course. And so it started. I immediately picked up my mileage and began to reset my boundaries of what was possible. I needed to rip out double long runs on the weekends and a couple of high intensity tempo runs during the week. Initially, the training was tough. My body was a little tired from the 50 miler but eventually it adapted and the envelope began to get pushed out even further. At the same time, my preparations began to fall into place. A good friend, Kalon volunteered to crew for me and pace me through the night. His wife, Jill also volunteered for my crew. I had the team assembled for the race and now it was time to figure out my nutrition strategy. I tried a variety of foods over the next few runs trying to find the ones that would help me stay strong throughout the race. At the end of July, I headed up to Haliburton to run the course. As I navigated the race course, I enjoyed the terrain and could picture myself on the course on race day. The very next day, I officially signed up for the race. I was #17 on the list and proud of it! Only 7 weeks to go until the big day. As I got closer to race day, I realized that I needed one final long run that would give me the mental boost and physical training to get me ready for Haliburton. EAT DIRT was borne. EAT DIRT was a 50 mile course in Uxbridge that navigated through Durham Forest and Walker Woods. EAT DIRT stood for Eman’s Annual Test of Durham’s Incredibly Rough Trails. Kalon created the course and it was one hell of a course. It had everything that I needed – hills, hills and more hills. It also featured some serious single track sections that would get me ready for the tough course conditions that Haliburton would offer. On August 22nd, EAT DIRT logged its first finisher and the course record was set at 10hrs 48 minutes. After the run was over, I could feel the strength in the legs. I knew that I could keep on going if needed. I knew right then that I was ready for the race. As we drove up to Haliburton, the stress of the race was increasing as we got closer. I was feeling so scared with the notion of running so many kilometres non-stop. We got to the race headquarters at 4pm and picked up my race kit. I also did my mandatory medical check and weigh in. I put a few extra pounds on leading up to the race thanks in part to my wife’s amazing pre-race lasagna. At 6:30pm, the pre-race briefing and dinner took place. The course official went on for a few minutes about the wet conditions and care that each racer needed to take with their feet. He even mentioned a wonderful section of the trail that each racer would amaze at its beauty until they realized that they needed to go through it. Later, I would nickname that section the River Nile. After the dinner, I retired to a nearby cottage for an attempt at a good night sleep. Thankfully, I was able to get in 5 hours of sleep. North America would ever achieve was daunting. The bagpipers played the racers out to the start line and then we were off. At first, it seemed like a regular long run. I wanted to run the race my way so I tried to ignore everyone else and just focus on my pace. I tried to channel out the conversations but it was not easy. As I reached the 11K mark and the second aid station, I made my first contact with my crew. The aid station strategy was simple – get in and out of the aid stations as fast as possible. I went blasting out of the aid station and passed by a good number of runners as they looked for their drop bags. Right then I knew that my crew was going to be a major component of my success. From there, I settled into a pace that was strong but not crazy. I tried not to kill myself in the first 50 miles but I wanted to get in as many kilometres in before nightfall. As I approached the 25 mile mark, I felt like I was going a bit too fast so I decided to slow it down a bit on the way back to the start line. Everything felt great during the first loop except for my stomach. It was extremely difficult to keep it steady. I struggled with an upset stomach that would prevent me from taking in desperately needed calories. I forced myself to eat and drink at regular intervals. Initially, I wasn’t taking in enough electrolytes but a few stern but loving words from Kalon set me straight. As I approached the halfway mark, I had the opportunity to see who was in front of me. As each runner went by I counted them out and quickly realized that I was in the top 10. I reached the 50 mile mark in 9hrs and 58mins. Not bad for the first half of the 100 miler! To say that turning around and going back out what mentally difficult, would be an understatement. As I played the first loop in my mind, I was thinking to myself, how in the hell can I run all that again? None the less, I turned around and headed back out into the trails. At 82K, I stopped at the aid station to get a sock change. My toes were rubbing and I needed to address it before it got out of control. Thankfully, I got a sock change in sub 1 minute and off I was back onto the trails. Once I left the aid station, my mind quickly focused on covering as much ground as possible before nighttime. If I could get to the 110K mark before nightfall, that would be amazing. The next few sections featured some tough hills and water obstacles. By that point, I didn’t care about my feet being wet or not. At 105K, I pulled into an aid station and needed to deal with a blister on my foot. Quickly, the crew strung into action and they got it fixed and changed my socks. They gave me a soft thicker sock to help with the constant pounding of the ground on my feet. As I left my crew, I grabbed a night light as the sun was setting but it wasn’t nightfall yet. Kalon was ready to come out with me at 105K to pace me but it wasn’t 8pm yet. Pacers weren’t allowed onto the course until after 8pm. So off I went to 110K, knowing that this was my final 5K alone. I picked up my pace because honestly, I really wanted the company. I pulled into the 110K aid station at 8:15pm and grabbed Kalon. We immediately shot out of the aid station and headed back onto the trail. I immediately perked up with excitement and the pace also picked up. I dreaded the next 20K because there was only 1 aid station in that 20K section. To my amazement, we ran the 10K distance to the 120K aid station in just 1hr 15min. I finally reached the top section of the course. It was time to go home. As I rounded the pylon at 120K, I said goodbye to it and we immediately headed back into the trail. The next 10K section was also fast. Throughout this 20K section, we passed a number of runners. From our guess, I was in the top 5. Once we got past the 130K aid station, I finally had to take a walk break. After almost 18hrs of straight running, it was time to finally walk for a bit. My stomach also was giving me so much trouble. I walked for the next section but quickly realized that running was the faster way to get home. For the next 24K, we would run and walk sections of this course. The terrain was very rugged and I was scared in some sections to run because I was so tired. One wrong move and I would be injured and have to pull from the race. As we got to the 153K mark, I just wanted to get out of the trail. The final 7K was a logging road with lots of hills but I knew that I could handle it more than being in the trails. Once we hit the logging road, we looked at our watch and realized it was just after 4am. A sub 24 hour time was going to happen but perhaps a sub 23 hour time could be possible. We immediately picked up the pace and started to run full out or as much as full out could be after 22hrs of racing. We made it into the second last aid station at 154K and didn’t stop. I grabbed some food and kept running. I had a finish line to get to. As we got closer to the final aid station at 158K, I kept thinking that I could see the flashing red light that signaled the aid station. Finally, after we turned a corner, the flashing red light become visible and the tears of joy started to stream down my face. We ran right through the final aid station on our way to the finish line. I called my wife as I ran out of the aid station to let her know that I was on my final mile. She was happy to know that it was over and amazed at the time. As we made the final turn towards the finish line, only 1K separated me from a chair. I ran my heart out for that final kilometre. As much as my body wanted to stop, my mind kept propelling my legs to keep moving. We quickly approached the finish line and the end of the longest race of my life. I couldn’t help but be overcome by the emotions of realizing a dream of this magnitude. I crossed the line in 22hrs and 52mins. I broke 23 hours! Once we crossed the line, I immediately felt the effects of the almost 23 hours of running. I sat down and enjoyed the first minutes of rest. I asked the volunteers what place I came in and they let me know that I was the third runner to finish the race. I had to ask about 3 times to make sure that they had it right. How could this be? How could I not only finish a 100 miler but also finish in the top 3? For the first couple of hours, it didn’t fully register that I had accomplished such an impressive finish time and place. It wasn’t until I went back to the finish line later in the morning after a quick nap that it become reality. As we left Haliburton heading back to the city, I felt such an incredible feeling of accomplishment in not only finishing the 100 miler but in having such a fun time doing it. I truly enjoyed the race. It was an incredible challenge and one that I was able to overcome and achieve success. I would love to say that the next few days I had no pain from the race but that would be a total lie. Stairs were my enemy and side stepping or doing them backwards was the only way to get down them. Four weeks has gone by since the race but I still find myself drifting back to it in my thoughts and dreams. I can instantly recall the difficult sections like the River Nile and the 2K monster hill at the top section of the course. 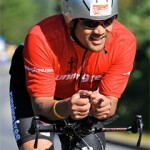 I can confidently say that another 100 miler is absolutely in the cards for 2011. The tough question is which one. I couldn’t care less about the time. It’s about the challenge of doing it. Plus, the buckle is quite the eye catcher. I wore mine with my suit for a few days after the race. Why not, I ran 160K for the right to wear it! In one short year, I have learned so much about myself and the journey. The key is going out and having fun. Forget about the time and just enjoy the journey. I did and I am forever changed. Well I think that you’re insane – but that’s why we luv you! I look forward to hearing the training stories and of course – the full account of the next race!!! And the belt buckle – pretty spectacular! : ) Happy trails my friend! Well done! In both your accomplishment and this report. This is totally epic. I can’t even wrap my head around what you 100 milers do. Congratulations on your ultra running races! A 100 miler is pretty impressive! And to finish top 3 is fantastic! Good Luck in your future races! Hope your legs & feet heal well! Way to Eamon! That was a great article, very inspirational!! Almost makes me want to do one…. almost! ABSOLUTELY AMAZING!!! What an incredible journey! I ran my first marathon in July on Haida Gwaii and my second in Victoria. You truly are an inspiration! People always ask me what’s next? I am not sure, but I LOVE to run. Good luck in your next ultra!! Your are amazing! So proud of your accomplishments! Nicely done…What a great report with lots of encouragement to us newbies! Thank you for sharing your experiences. Copyright © 2013 Compasso Theme. All rights reserved.